You know that feeling when you’re going to watch a movie but you’re not very excited because you don’t think it’ll be very good? Maybe it’s a sequel or a remake, but for whatever reason you just can’t shake the feeling that you’re in for a bad movie? 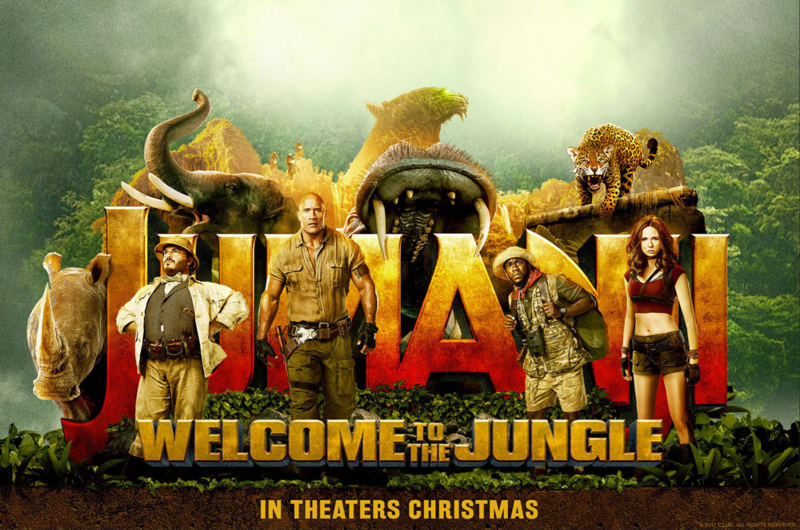 That’s how I felt walking into Jumanji: Welcome to the Jungle (rated PG-13) last night. I was worried I’d be very disappointed but when I walked out of the theater I realized I was extremely wrong. In fact, I was so wrong that I give Jumanji: Welcome to the Jungle 4 out of 5 stars. Jumanji shone so bright because of its characters and the talented actors that played them. Across all of the characters there was something that everyone in the audience could relate to, so it was very easy to become invested in the suspense that came with their mission (which was to traverse a super dangerous video game jungle in order to return a jewel to it’s shrine and be teleported out of the video game). Each of the high school students had chosen a character before they were transported into the game. One of the funniest characters in the movie was Bethany, the conceited popular girl who was turned into Jack Black. You’ve got to give props to Black for learning how to act like a teenage girl so convincingly. What really pushed Jumanji to earn that fourth star from me though was the fact that, unlike most comedy movies, it actually had great character development and a strong positive message. By being someone else in the game each of the characters learned valuable lessons about what it means to be yourself and be proud of who you are in the real world. The characters grew so much and learned that no matter who you are you should own it and just be yourself. I really appreciated being able to walk out of a movie that was both so funny and so uplifting. If you haven’t seen Jumanji yet and you’re in need of a good laugh or a movie that will make you smile when you walk out of the theater, definitely go get a ticket now, if not solely for the opportunity to see Jack Black slowly develop a crush on Nick Jonas. Be sure to share your opinions on the movie with us on Facebook @the208group and on Twitter @the208group! Happy watching and happy New Year everyone!